﻿“The Sons of Thunder” sounds like a rock band, a movie or a motorcycle club. Actually the name has been used for all three. But Catholics might also know this term as the biblical reference for two of Jesus’ most beloved apostles: James the Greater, the son of Zebedee, and his brother, John. “He named 12 as his companions whom he would send to preach the good news. They were likewise to have authority to expel demons. He appointed the 12 as follows: Simon, to whom he gave the name, Peter; James, son of Zebedee, and John, the brother of James (he gave these two the name Boanerges, or ‘sons of thunder’); Andrew; Philip; Bartholomew; Matthew; Thomas; James, son of Alphaeus; Thaddaeus; Simon of the Zealot party; and Judas Iscariot, who betrayed him.” Mark 3: 14-19. Fishermen on the Sea of Galilee, James and John often worked at night. The Galilean race was considered religious, hardy and industrious with a vehemence of character. Several stories in the Bible show a temper and fire in the two brothers that may have contributed to their nickname. When the Samaritans did not welcome Jesus when he was en route to Jerusalem, James and John asked Jesus, “Do you want us to call down fire from heaven to consume them?” Luke 9: 54-55. James and John were also the apostles whose mother asked if her sons could sit at the right and left of Jesus, a request that showed their passion, but also a lack of understanding of their mission. St. Luke also tells us that when the two brothers saw a man casting out devils in the name of Christ, John said, “We tried to stop him because he is not of our company” Luke 9: 49. However, the two brothers apparently held a prominent place with Jesus and among the other apostles. It was James, John and Peter who Jesus asked to accompany him to the mountaintop where they witnessed the transfiguration. It was James, John and Peter who were present for the miracle of the raising of Jairus’ daughter. And the same three were among the closest to Jesus in the Garden of Gethsemani the night before he died. 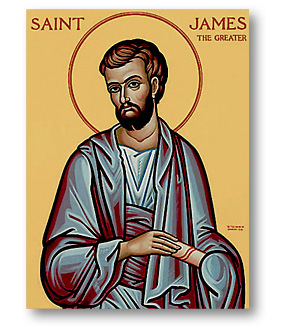 St. James was martyred about 44 AD. He is thought to be the first apostle to die for his faith. St. John, who became known as the “beloved disciple,” is the only apostle to die a natural death. He died in Ephesus about the year 100.